Home / Brexit / Cartoon / Humour / May / News / Tories / UK / So .. Which Direction Now For Brexit ? So .. Which Direction Now For Brexit ? 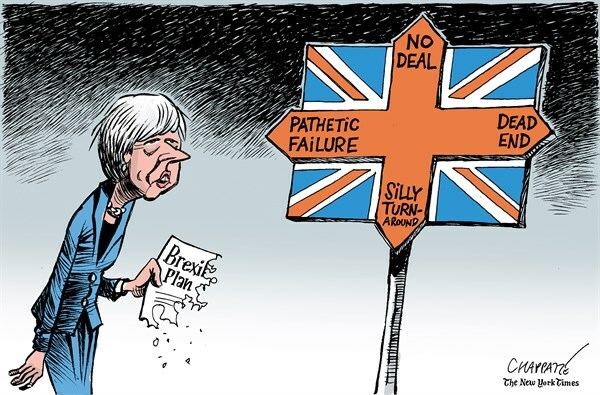 Theresa May again addressed the House of Commons today, seemingly to announce her much-heralded Brexit 'Plan B', only to reiterate support for her 'Plan A' .. the one that was defeated by an historic majority. Having already discounted the only two options that would solve the deadlock - A Second Referendum or a General Election, she has no further direction to go. Jeremy Corbyn described it correctly, as another 'Groundhog Day'. We suspect she's simply attempting to run out the clock, so that she can tell the Commons that her Deal is now the only option for which there is time.